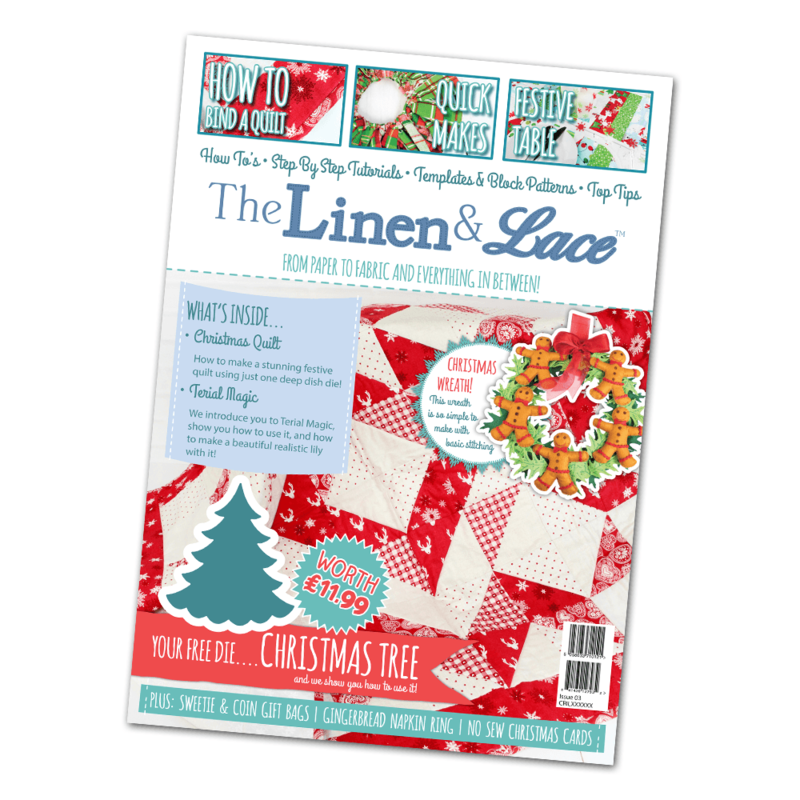 Welcome to the latest edition of the Linen and Lace magazine – and to a fabulous Christmas inspired bundle. We all love creating those fabulous handmade crafty gifts, with chilly evenings just perfect for cuddling up under your best loved quilt enjoying oodles of gorgeous festive food, but it all takes time to prepare. So we look forward to sharing lots of creative inspiration so you can start creating straight away. This magazine is for all levels of sewer – from those who have never touched a needle to those who have sewing in their DNA. So we have included projects to suit all ages and abilities – with some requiring no sewing at all! There are a bumper 6 projects use the adorable free Christmas Tree cover die, ways to use Terial Magic to make fabric behave like paper and a couple of hand sewing projects too. We have a festive table setting to get those juices flowing as well as quilts, cushions and bags galore. With our tradition of education, this magazine will show you 2 different ways of using zips (in a bag and on the back of a cushion) as well as 2 methods of attaching binding (with straight strips and bias cut strips) and with expert tips throughout. We really hope that this Festive edition of Linen and Lace magazine will fill you with ideas for your home and for that never ending list of Christmas gifts. Just remember, it is never too early to start!